Window costs per square foot will depend mainly on the material that is used for the mainframe and sill. Of course, the type of window glass you select, and the number and options of upgrades and add-ons that you opt for will also have a significant effect on the per square foot price of replacement windows. We will go through the five main replacement window materials, including vinyl, fiberglass, aluminum, composite and wood windows. Vinyl windows will run anywhere from $40 – $90 per square foot fully installed, which includes the window itself and the installation and labor costs. These are the least expensive of all of the five major replacement window materials. 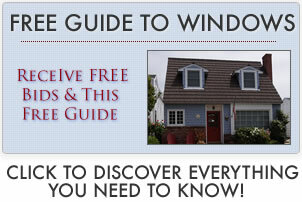 Here are some examples of specific vinyl window sizes and the range of price points for each. Fiberglass windows run anywhere from $60 – $100 per square foot fully installed, which includes the window itself and the installation and labor costs. These are slightly more expensive than vinyl windows, however, they are less expensive than a wood clad window. Here are some examples of specific fiberglass window sizes in the range of price points for each. Aluminum window frames run anywhere from $60 – $110 per square foot fully installed, which includes the window itself and the installation and labor costs. Aluminum windows are very close in price to fiberglass window frames. Here are some examples of specific aluminum window sizes and the range of price points for each. Composites run anywhere from $50 – $110 per square foot fully installed, which includes the window itself and the installation and labor costs. Composite windows are also very close in price to both fiberglass and aluminum replacement windows. Here are some examples of specific composite window sizes and the range of price points for each. Wood clad run anywhere from $60 – $130 per square foot fully installed, which includes the window itself in the installation and labor costs. Wood windows are the most expensive of all replacement window frame options. Here are some examples of specific wood window sizes in the range of price points for each. The type of window glass that you use will certainly affect the per window cost of your replacement windows. The cheapest of all class options is a clear glass, which typically come standard with any window that you purchase. An upgrade to a low E glass should run $25, an upgrade to a low E2 glass will run $50 and an upgrade to a low E3 glass will typically run roughly $75. Laminated glass is the strongest of all replacement glass and is typically reserved for a hurricane or impact window and should run somewhere around $100 to upgrade from a clear glass option. Most replacement windows, especially vinyl windows, come with a standard plastic hardware for the lift rails and can locks. However, consumers can upgrade to a nicer metal hardware which will typically run $50 per window. Argon or krypton fills inside the glass panes may come standard on many models, if not, the upgrade should run $25 for the argon and $40 for the krypton. Most replacement windows today include a non-metallic spacer, however, there are certain manufacturers who will charge you $25 to add one of the spacers between the window panes. Finally, many manufacturers will charge $25-$50 for a sill reinforcement which adds to the durability of the overall window. Adding a half screen to your replacement windows will usually run an additional $50 and a full-screen will run $75. Most replacement windows will include grids at no extra charge, however, certain manufacturers will charge $25-$50 to add one of several grid configurations to the inside of the window.